Packing his story with one awesome–and awesomely funny–number after the other, Mel Brooks has fundamentally taken an already outstanding screwball comedy from the screen, and transformed it into an altogether more outstanding screwball musical comedy for the stage; Rest assured, this time, the jolts you’ll be getting have nothing to do with the electrodes in any lab—these are jolts of laughter from this A-Plus new production! “That’s ‘Fronkensteen’! 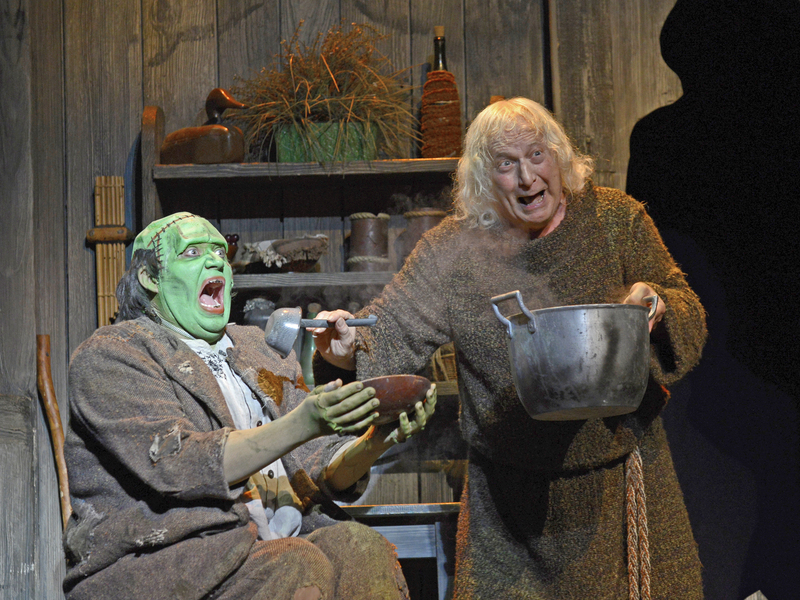 My name, it’s pronounced ‘Fronkensteen’!” insists young Dr…well, “Frankenstein”. Regardless of what pronunciation he personally favors, he’s still the grandson of “Dr. 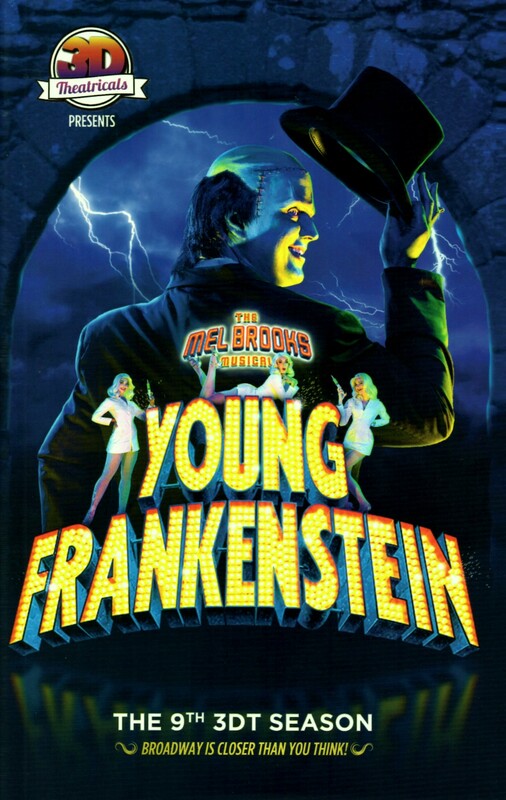 Victor Frankenstein”, the infamous monster-maker of film, folklore, literature, and this time around it’s he—not ‘Dear Old Granddad’ who’s at the center of “Young Frankenstein”, the hit musical adaptation of Mel Brooks’ 1974 laugh-a-minute blockbuster. 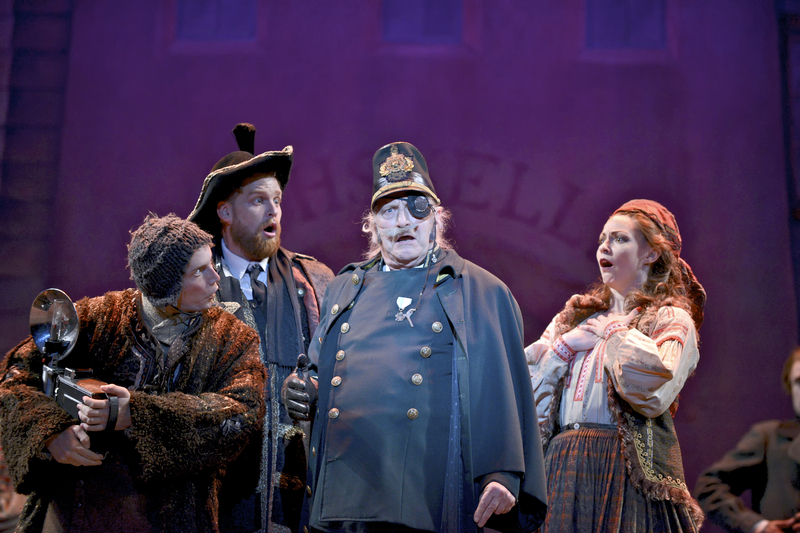 Now just in time for the Halloween Season, 3-D Theatricals—one of Southern California’s most notable and Award-winning Theater companies, has opened their phenomenal ninth season with this equally uproarious musical. 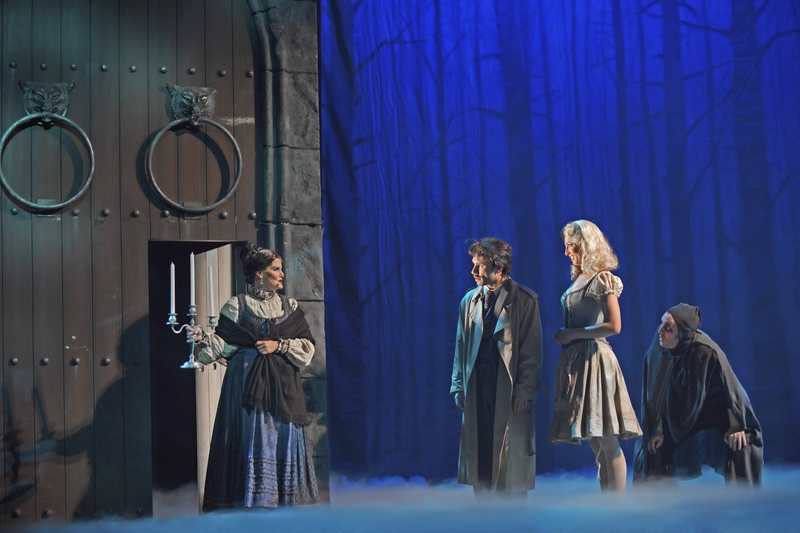 Unfolding in the foreboding ancestral “Castle Frankenstein” out on the foggy moors of “Transylvania Heights”, the basic premise is one that’s familiar to just about all of us: Young “Dr. 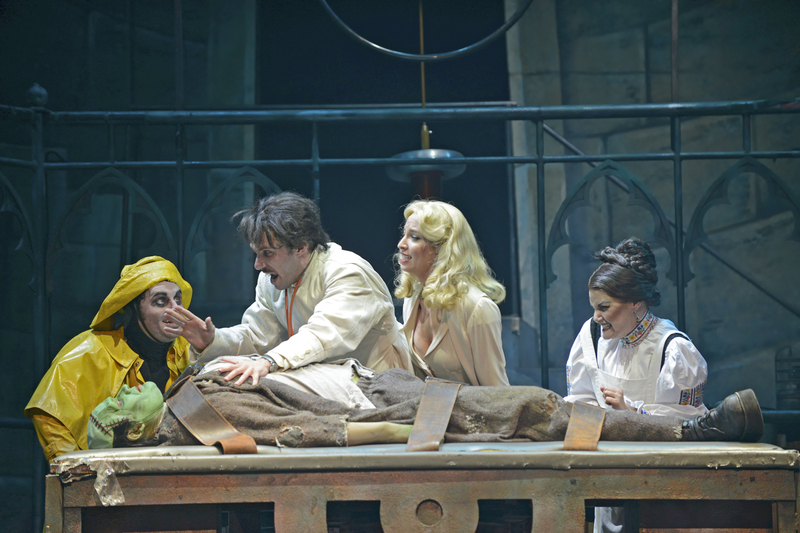 Frankenstein” (–OK, “Fronkensteen”,) attempts to match his grandfather’s masterwork by bringing a corpse to life. 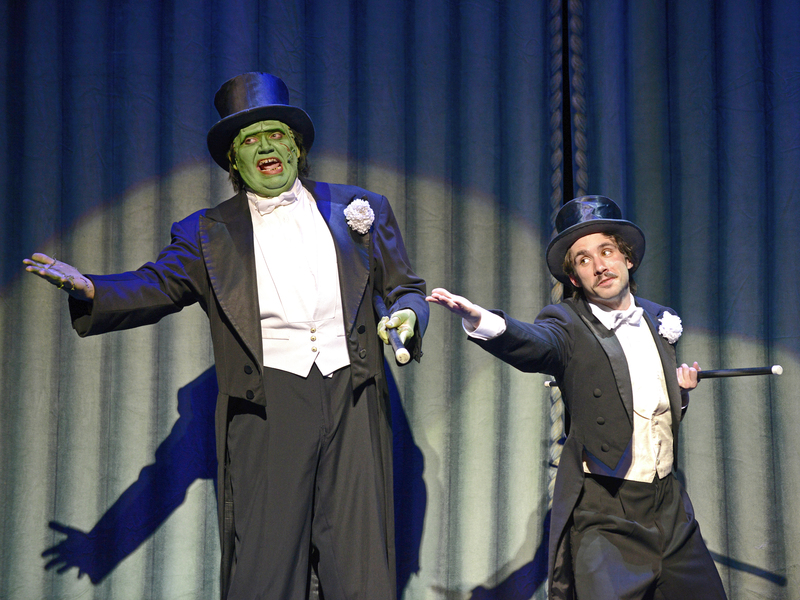 Together with his oddly-shaped but endearingly mischievous helper “Igor” (pronounced ‘Eye-gor’), his curvaceous lab assistant “Inga”, and despite “Elizabeth”–the incredibly self-involved New York Debutante he’s engaged to, the “doctor” succeeds in creating a hulking monster– but one not without a flair for a spectacular song-and-dance number! 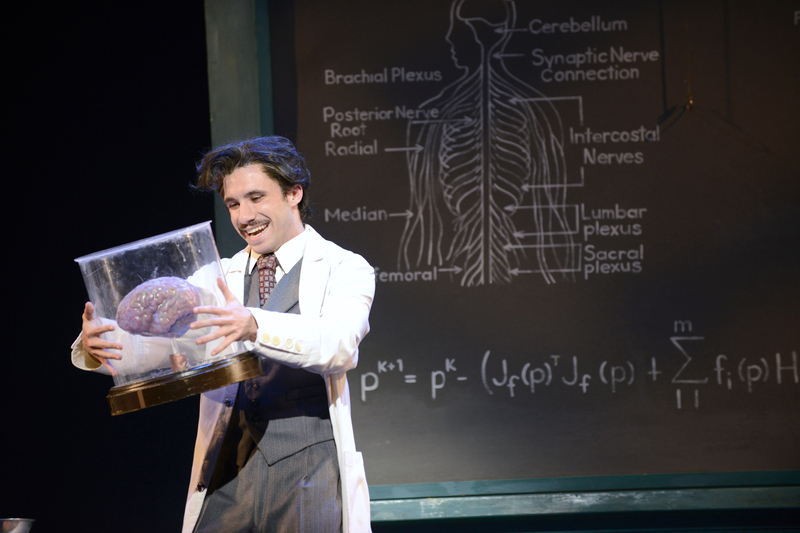 Rest assured, this time, the jolts you’ll be getting have nothing to do with the electrodes in any lab—these are jolts of laughter from this A-Plus new production! Very loosely derived from the time-honored horror tale by Mary Shelley and the numerous movie versions that have followed (essentially since the dawn of the art-form,) this musical rendering is distinguished by a stunningly (and in few cases, stingingly) funny book by Mel Brooks and Thomas Meehan (based on the screenplay by Brooks) and features music and lyrics by ol’ Mel himself–built on, in several occasions, tunes and song-snippets he wrote for his landmark movie of the same name. Packing his story with one awesome–and awesomely funny–number after the other, Brooks has fundamentally taken an already outstanding screwball comedy from the screen, and transformed it into an altogether more outstanding screwball musical comedy for the stage–one that’s over-flowing with bawdy, borsch-belt humor, snappy one-liner’s and sight-gags, and all crowned with some stupendous songs, which run the raucous gamut from the sporty “Transylvania Mania”; the dramatic “He Vas My Boyfriend”; the chipper “Roll In The Hay”; to the slightly perplexing “Together Again (For The First Time)” and also including the unforgettable extravaganza (complete with kick-line) built around Irving Berlin’s classic “”Putting on the Ritz”. Moreover, with direction here by David Lamoureux, Choreography by Daniel Smith, and Musical Direction by Corey Hirsch, this talented and perspicacious trio have taken this blazing fire-ball of entertaining material and run with it all the way into the championship zone! He warns that one relative still remains—the doctor’s grandson, “Frederick”: “The Dean of Anatomy at New York’s most famous institute of higher learning—‘The Johns, Miriam, and Anthony Hopkins School Of Medicine”. Immediately we’re transported there, where we find that same grandson conducting a lecture about his most favorite bodily organ—“The Brain”. Yet, still the students insist on plaguing him with questions that have pursued him all of his life”: ‘It’s been said, nay even sung, that your grandfather’s monster hurt and lamed, killed and maimed. Is that true, Doctor Frankenstein?” They query. Informed of his famous fore-bearer’s passing, he’s called to the family’s ancestral castle in—you guessed it—Transylvania! Shortly before getting on the ship and departing he bids a frustrated farewell to his excruciatingly-chic betrothed, but it’s something of a cold comfort, since she’s so sumptuously arrayed, she flat-out won’t let him kiss her good-bye, begging him “Please Don’t Touch Me” while tantalizing him with suggestive promises once he returns. Their parting isn’t without at least some semblance of affection though—they do get to “air dance’ (together and near one another–but about two feet apart,) which is soon imitated by several other couples—similarly close, but separated, leading into one of the show’s more creative dance interludes: A flowery waltz dubbed “The Please Don’t Touch Me” (forget “The Continental” or “The Bunny Hop”—this, we’re informed, is “the new dance craze that’s sweeping Catholic Girl’s schools all over the Midwest”!) It’s a little off-beat but undoubtedly an Act One crowd-pleaser. At the castle, Frederick dreams that he’s visited by the ghost of his nefarious patriarch (–the old guy they were planting in scene one,) who instigates another awesome group triumph—“Join The Family Business”, where Brooks’ comedic genius is on full display! Executing some bold “Russian Ballet” like moves with plenty of breathtaking pirouettes and grand-jetes, those assembled (as the Frankenstein Ancestors) construct a humongous effigy of the iconic Frankenstein monster right before our eyes (which then tries to stomp on Fred!) If this weren’t enough, also featured is a singing skeleton named “Mordechai”. “My ancestors are crazy—but boy can they dance!” Frederick breezes upon ‘waking up’. Not long after, delightful “Barbershop” style harmony is also supplied by five gents billed as “The Transylvania Quartet” who perform “Welcome To Transylvania”. 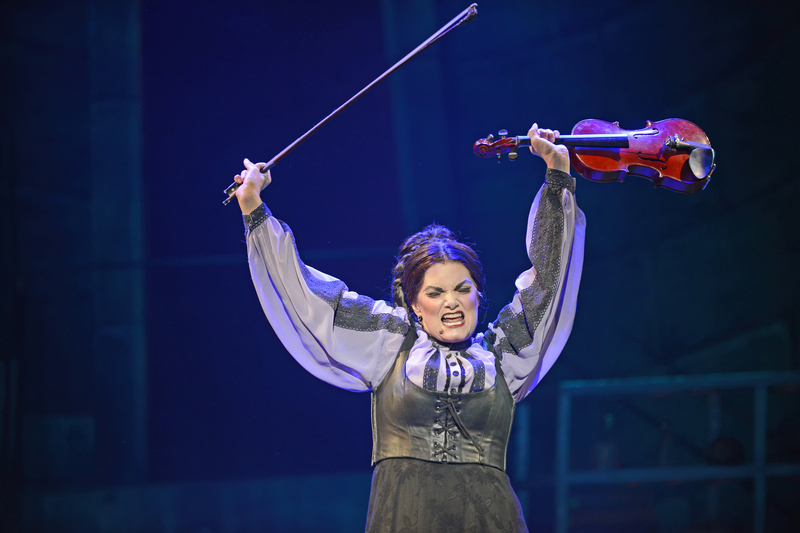 Seen just before the act break, it serves as a terrific segue for the nifty “Transylvania Mania”–another rousing group endeavor that closes Act One. 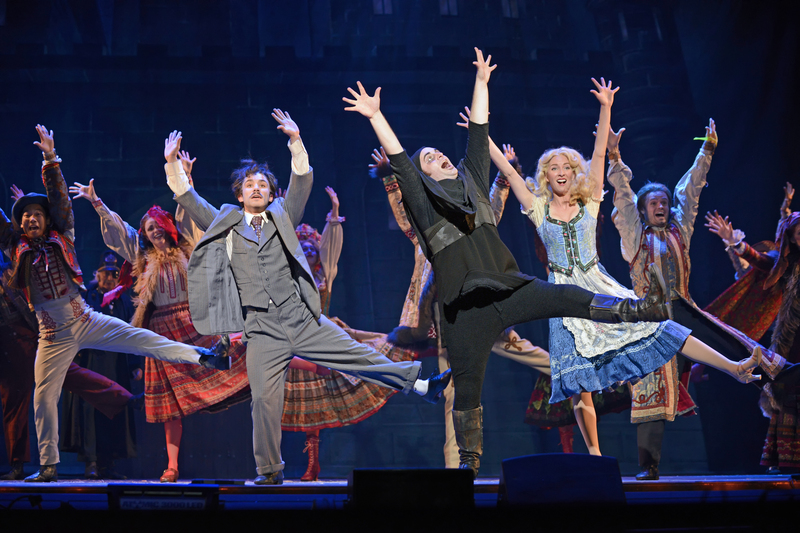 A prime example of “fun’ choreography if ever there were any, led by the doctor’s hunchback henchman, “Igor”, its part Polka, part Jive and Jitterbug, and all eye-popping! “Everybody who’s been viewing it, can’t resist its appeal. Everybody’s out there doing it—Millionaire and Schlemiel!” proclaim the townsfolk joyously. (Too bad it has to end with the monster breaking his chains and heading out on a rabid rampage.) After intermission is where all “Mel’ breaks loose, with much of the action conveyed in a series of brief comic vignettes. As for big numbers, far and away the biggest of the big is “Puttin’ On The Ritz”—a holdover from the film which, herein has been expanded and re-envisioned into the musical number to end all musical numbers! 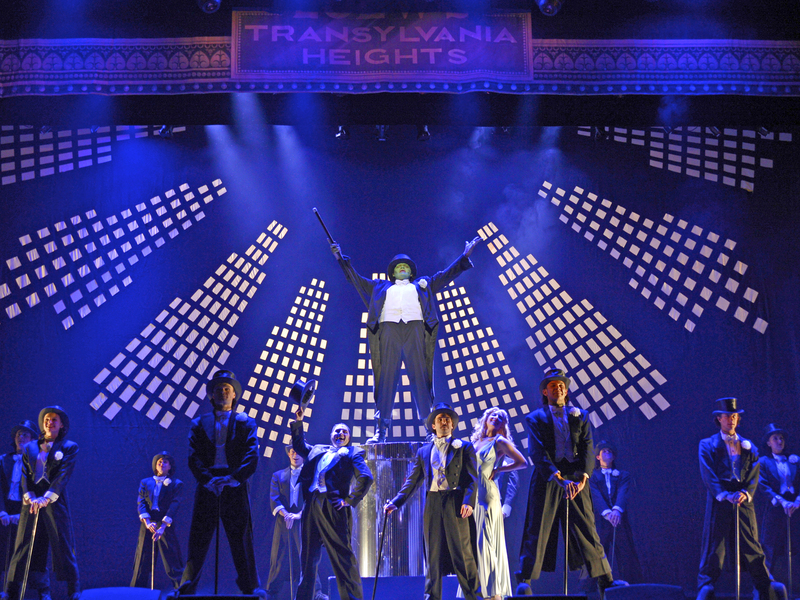 Rooted in “Frederick’s” desire to demonstrate a gentler and more ‘human’ side to his brawny creation, it builds into…uh…a monster of a showcase that has the creature performing a debonair routine opposite his own shadow (with the shadow a few beats behind–or working on different steps entirely!) Before he’s through, he’s joined by a whole tap-line—all in elevated “monster” tap shoes. (Go on! Dare your toes NOT to tap along!) It’s so silly it works in spades, and to top it off, we at last get to hear the Monster sing (sort of) and dance. (Busby Berkley—eat your heart out!) Subsequently, even the curtain-call plays like a brisker, bubblier variation on the traditional “Ländler tanzen”, sending the audience out on a resounding high note! Jean Yves-Tessier’s moody lighting design works in perfect tandem with Jonathan Infante’s projections, which include flashes of lighting (of which there are plenty in this particular show,) and eerie shadow effects from ersatz candles–not to mention the somewhat disquieting lab equipment (–look close and you’re sure to spy a workable Tesla coil too!) Each conjures the look and feel of one of those spine-tingling old Universal black-and-white monster-pictures of the ‘30’s and ‘40’s. They’re also responsible for some brilliant ‘visual puns’ and splashy ‘cinematic’ effects via several shrewdly timed projections. Upon entering the auditorium, attendees are greeted by a looming projection of the castle perched on at the zenith of a tall, craggy hill with an equally, jagged and perilous road straining its way to the pinnacle. At lights down, the title projection (familiar to anyone who’s seen the film) suddenly appears illuminated by the standard lightning flash, followed by the list of “starring” credits with the cast-member’s name and which role we can look forward to seeing them in (–also reminiscent of the film.) Let’s not over the look the amazing sound design by Julie Ferrin either, which, in effect, creates vividly crisp, ‘surround-sound’ throughout the theater! The costumes, by NETworks are a recreation of the Broadway originals by William Ivey Long, and are a work of art in their own right—including copious examples of Multi-colored Tyrolean garb to smooth, ivory lab-coats, and Igor’s vintage yellow rain slicker and matching hat to boot! Furthermore, how many times do you hear even the orchestra get complimented? Yet more than a few of these appreciative comments praising their magnificent work were overheard from the exiting throng on opening weekend. Production Stills By “Caught in the Moment Photography” (CaughtintheMoment.com) Courtesy Of Michael Sterling & Associates (www.msapr.net) and “3-D Theatricals”; Special Thanks To Michael Sterling, T.J. Dawson, David Lamoureux, Daniel Smith, Corey Hirsch, Mel Brooks–And To The Cast And Crew Of “3-D Theatricals” 2017 Production Of “Young Frankenstein” For Making This Story Possible. 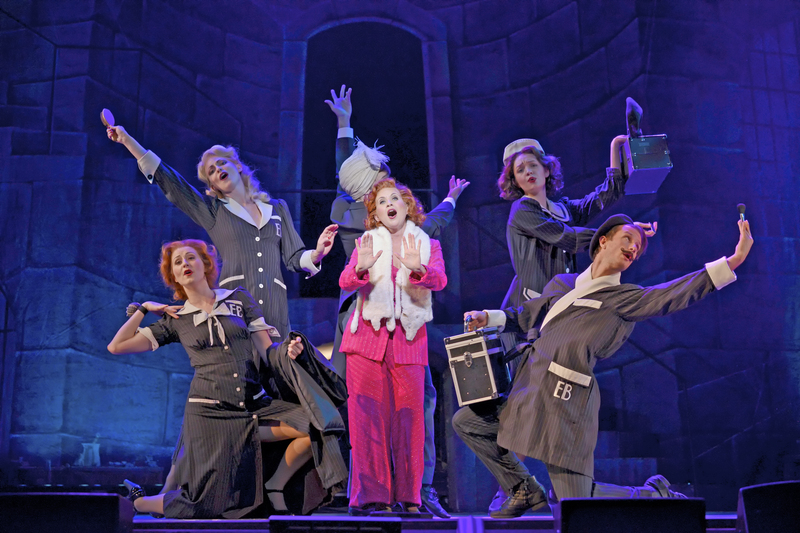 This entry was posted in Theater reviews and tagged "Puttin' On The Ritz", "Young Frankenstein", 1974 Movie Comedies, 2008 Tony Nominated Musicals, 2017 So Cal Theater Season, 2017 Southern California Theater Season, 3-D Theatricals, 3D Theatricals, Best Musical Nominees, Cerritos CA., Cerritos California, Classic Hooror Movies, Classic Monster Movies, Corey Hirsch, Daniel Smith, David Lamoureux, Eye-gor, Frankenstein, Frau Blucher, Fredrick Frankenstein, Fredrick Fronkensteen, Halloween Musicals, Harold The Hermit, He Vas My Boyfreund, Horror Comedies, Horror Musicals, Horror themed musicals, Igor, Inspector Kemp, Irving Berlin, Jean Yves-Tessier, Join The Family Business, Jonathan Infante, Julie Ferrin, Man About Town, Mary Shelley, Mel Brooks, Musical Screwball Comedies, Redondo Beach Ca., Redondo Beach California, Roll In The Hay, Screen to Stage Musicals, Susan Strohman, The Cerritos Center For The Performing Arts, The Happ[iest Town In Town, The Mel Brooks Musical, The Please Don't Touch Me, The Redondo Beach Performing Arts Center, The Transylvania Mania, Thomas Meehan, Together Again For The First Time, Transylvania Heights, Universal Monsters, Universal Studios, Victor Frankenstein, Welcome To Translvania, What I Love About The Brain. Bookmark the permalink.